Diabetes myths abound, so my gift to you this holiday season are five diabetes truths you must know. Diabetes is a complex condition, with numerous tasks a patient must do every day to be well. Whether you live a long and healthy life with diabetes often depends on whether you have accurate information and know what to do, when to do it, why, how and how much. Decisions you make every day about food, carbohydrate counting, medicine, exercise, doctor visits, lab tests, blood sugar monitoring and more either increase or decrease your health. What better gift to give yourself or a loved one for the holidays than better health? Excerpt below from my book “50 Diabetes Myths That Can Ruin Your Life and the 50 Diabetes Truths That Can Save It” by Da Capo, a member of the Perseus Books Group. 1. 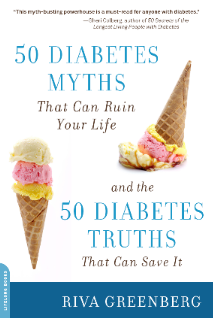 MYTH: Diabetes is the leading cause of heart disease, blindness, kidney disease, and amputation. TRUTH: Poorly-controlled diabetes is the cause of these outcomes. Well-controlled diabetes rarely is. Highly esteemed psychologist and certified diabetes educator, Dr. William Polonsky, says well-controlled diabetes is the cause of nothing. I like to add, except for a healthier and happier life. TRUTH: There is no longer any such thing as a “diabetic diet.” The same dietary guidelines recommended for all Americans: eat a variety of vegetables and fruits (five cups/day), whole grains, lean protein, low-fat dairy, healthful fats, and fiber, are recommended for those with diabetes. Sweets are allowed in moderation and should be worked into your meal plan. A healthy meal plan is one that take calories, carbohydrates and fats into account so that you can reach and maintain your weight and health goals. If you need help designing a meal plan ask your doctor for a referral to a licensed dietitian. TRUTH: If your doctor says you have “just a touch of sugar” or “you’re borderline,” you have pre-diabetes. Pre-diabetes is characterized by higher than normal blood sugar but not as high as type 2 diabetes. However, pre-diabetes puts you at risk for type 2 diabetes within five to 10 years. Losing some weight, if you’re overweight, and getting more active can reduce your risk of getting diabetes. The landmark Diabetes Prevention Program in 1992 found that lifestyle changes, more than medication, reduced pre-diabetics’ risk of getting type 2 diabetes by 58 percent. In people over age 60 the risk was reduced by 71 percent! 4. MYTH: Type 2 diabetes is not as serious as type 1. TRUTH: Type 1 and type 2 diabetes are equally serious because both can lead to the same debilitating diabetes complications, such as heart disease, blindness, kidney disease, and amputation. As I mentioned in myth number one, poorly-controlled diabetes — high blood sugar over years — causes these complications no matter what type of diabetes you have. While type 1 diabetes typically requires more intensive management, approximately 25 percent of people with type 2 diabetes have complications when diagnosed because they’ve usually had it for several years before diagnosis. 5. MYTH: If my doctor says it’s time for me to take insulin, I’ve failed. TRUTH: You haven’t necessarily failed, type 2 diabetes is progressive for most people. Over time insulin-producing beta cells become compromised and produce less insulin and the body uses insulin less effectively. About 40 percent of people with type 2 diabetes will require insulin to control their blood sugar. While most doctors delay adding insulin to a patient’s treatment plan, the renown Joslin clinic starts type 2 patients immediately on insulin for effective blood sugar control. Also, if you’re thinking insulin causes diabetes complications, it doesn’t. Complications are due to years of uncontrolled high blood sugar. You can read several more excerpts now to jump-start your improved health. What I know is the more you know, the better you’ll do. For yourself, a loved one or a friend with diabetes, why not give the gift of diabetes health this holiday? Besides, it will solve your problem what to give Aunt Jesse, and you won’t have to play “diabetes police” anymore when your loved one realizes the impact of what he or she eats on their diabetes. May the holidays be not just merry, but your or a loved one’s kick-off season for greater health and happiness.